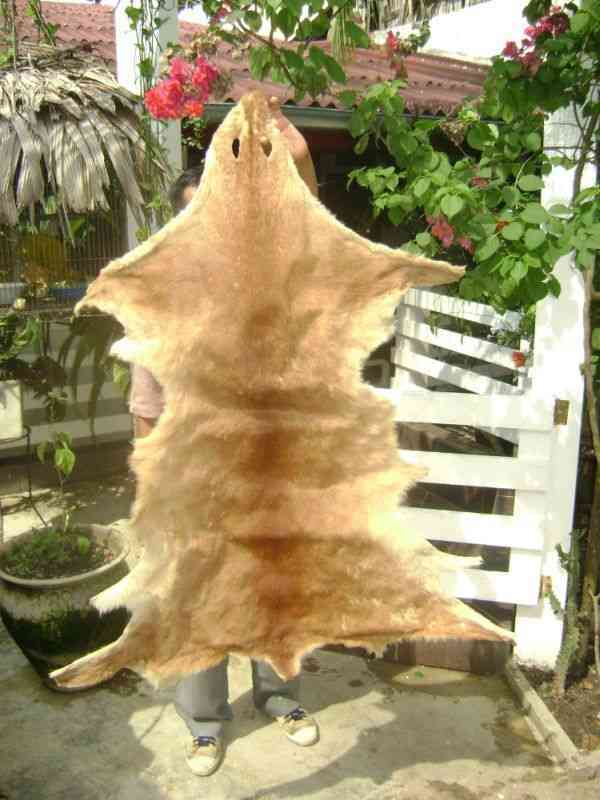 A Indian chief from the Matses tribe just brought this deer skin to my house as a gift. It is the largest skin I have seen here. Normally the deer are tiny. This came from the Yavari river which is the border between Brazil and Peru. 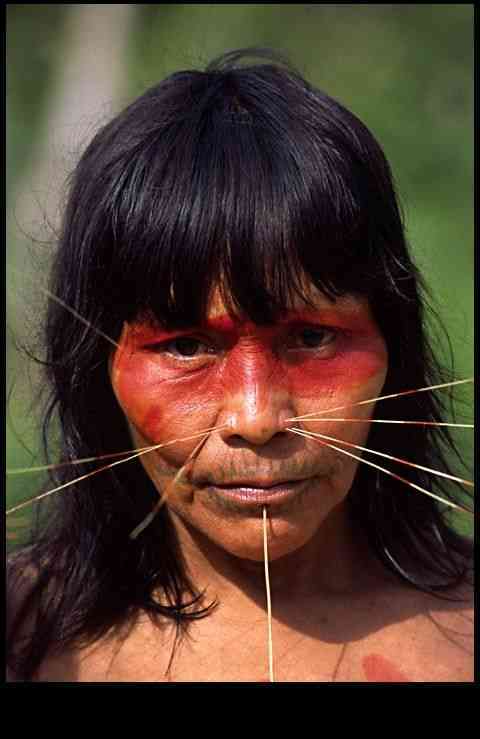 This is one of the tribes farthest away from any access and it is a several day walk to Iquitos. The nearest dirt air strip is in a village called Angamos and is not usable much do to the muddy conditions and it is at least a two week boat trip to here in Iquitos going down the Yavari to the Brazil, Peru and Colombia border and then Up the Amazon. This tribe is about the most abused by the non profit organizations as every one has "donate here" on thier websites to help them and they in reality recieve nothing as the non profits recieve and keep all the donations. What's he going to make from the skin Jim? He gave it to me as a gift and I have no idea as to what to make of it. Maybe a wall mount with felt backing and edging. I have a wall mout of a lion with the head at the farm in Wisconsin and I like that style. I would have thought he woulda made some slippers, but then I don't know how deer hide wears. One thing though, leather soles are slippery as heck on finished wooden floors. The wall mount seems like a nice idea to. A normal deer here weighs abot 15 to 20 pounds dressed with the skin. I would guess this one would have been at least 35. I have been friends with some of the chiefs of the Matses tribe for almost 30 years when they were known as the head smashers as anyone who went into thier land they would pound the intruders head with a club until it was a soft mess and when laying on a table the head would flatten out like a fried egg. Quite messy and not pretty. I have only seen one when in the border area of Brazil , Colombia and Peru who was brought into the police post. They still kill thier human enemies and smoke them and eat them but this custom is dissapearing. They are also famous for capturing women from other tribes or passers by on the river and taking them to thier village as another wife. I have been helping them fix some problems they have with some American Non Profit Groups taking advantage of them by collecting money on thier behalf and never the money gets to them. We are now trying to upgrade the schools and get them into the modern world and that is why they bring me this kind of thing. Last month they brought a pair of war spears. What I would really like is a used club they used for head smashing but have not got one yet as they are highly prized by the owners. 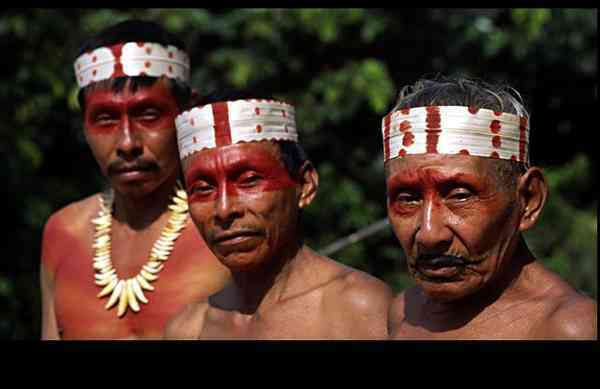 Here are three photos of the Matses people that I pulled off the internet showing how the elders look. There are still many like this but the tatooing of the face and the piercing is now about out of style with the younger generation. 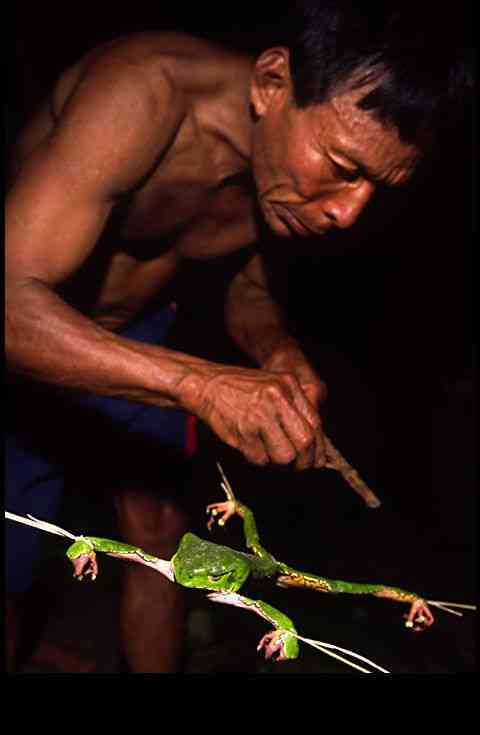 The photo of the frog is when they are scraping the hallucinagetic slime off the frogs back. They burn a spot on thier arm and put a drop of this slime on it and go on a trip for hours. The other photo is of a couple of the new generation chiefs. Things are changing.